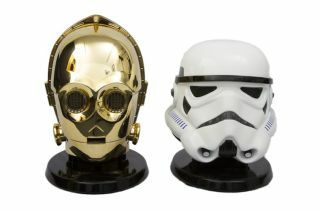 Star Wars C-3PO and Stormtrooper helmets are Bluetooth speakers | What Hi-Fi? London-based manufacturer AC Worldwide has created wireless Bluetooth speakers that look like C-3PO and a Stormtrooper from the Star Wars franchise. They’re now live on Kickstarter to secure funding. The heads have been designed and produced using multiple moulded components: the Stormtrooper helmet for example has 48 different parts. Sound is delivered through a 2.1-channel design, with two, 3W drivers behind the eyes and a downward-facing ported subwoofer on the bottom. The speakers themselves are 30cm tall and fully portable, and can be powered via either a mains cable or internal rechargeable battery, which lasts for a claimed four hours. They also come with NFC (Near Field Communication) for instant pairing with compatible devices and double up as a hands-free speaker for taking phone calls. AC Worldwide has obtained a license from Disney and, as a result, the speakers will come in a fully branded collectors box. Each speaker comes supplied with a carry case, cleaning cloth, auxiliary cable and power adaptor. Limited edition rose gold C-3PO and white gold Stormtrooper helmets are also available through Kickstarter, but are limited to seven models of each design. The project is live on Kickstarter now, where AC Worldwide is looking for £60,000 of funding. You can pre-order a speaker from £99.